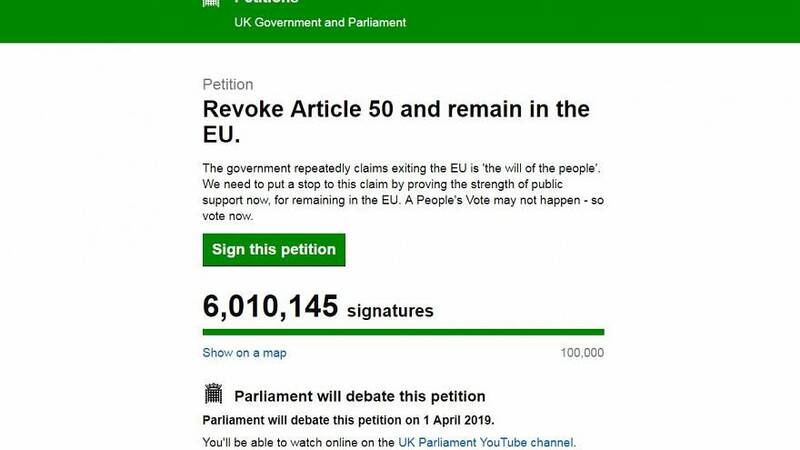 More than a day after the UK was originally scheduled to leave the EU, the petition asking the government to revoke Article 50 and cancel Brexit passed six million signatures on Sunday. The petition was submitted by retired lecturer Margaret Anne Georgiadou on March 20. More than 100,000 people signed it in the first two hours of it being online and it passed the five million mark last Sunday. Georgiadou told Euronews she has received death threats since the petition was posted online. Since then, Prime Minister Theresa May's Brexit withdrawal agreement was rejected for a third time on Friday. The UK Parliament will debate eight different non-binding Brexit options on Monday with the possibility of May bringing back her deal for a fourth time on Tuesday. For now, Britain is scheduled to leave the bloc on April 12 with the possibility of no-deal, unless May comes up with an alternative plan. What's in Theresa May's Brexit deal and why is it so unpopular? Brexit Guide: where are we now?